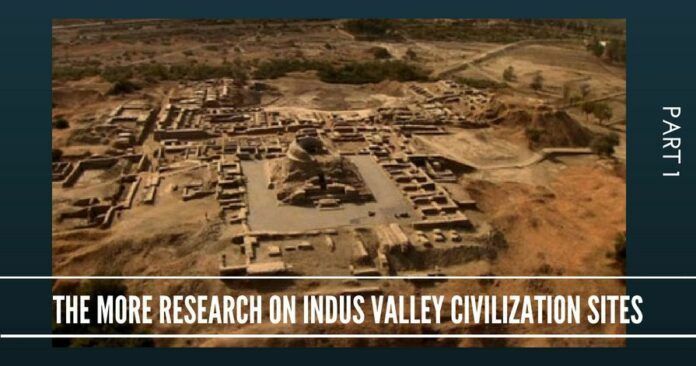 The objective of writing this piece was to analyze the revelations made in the referred article on the historicity and the epoch of the Indus Valley Civilization (IVC). However, we are well aware of the strategy of the leftist ideologues by now, who did not even spare Archeology, Sanskrit and Indology studies from painting them in ‘red’, twisting the facts to fit into an anti-religion and anti-Sanathana Dharma characteristic mould, aiming to dampen the ‘Hindu sovereignty’ perceptions and claims that may arise time and again, as and when the ongoing excavations at IVC sites would correct itself and takes the age of IVC further couple of thousand years back in BCE. However, the strang aspect of IVC is, the easternmost tip of the IVC site so far discovered is Shortugai bordering the present Tajikistan which is nearly 2000 KM from Bhuj, Gujarat. 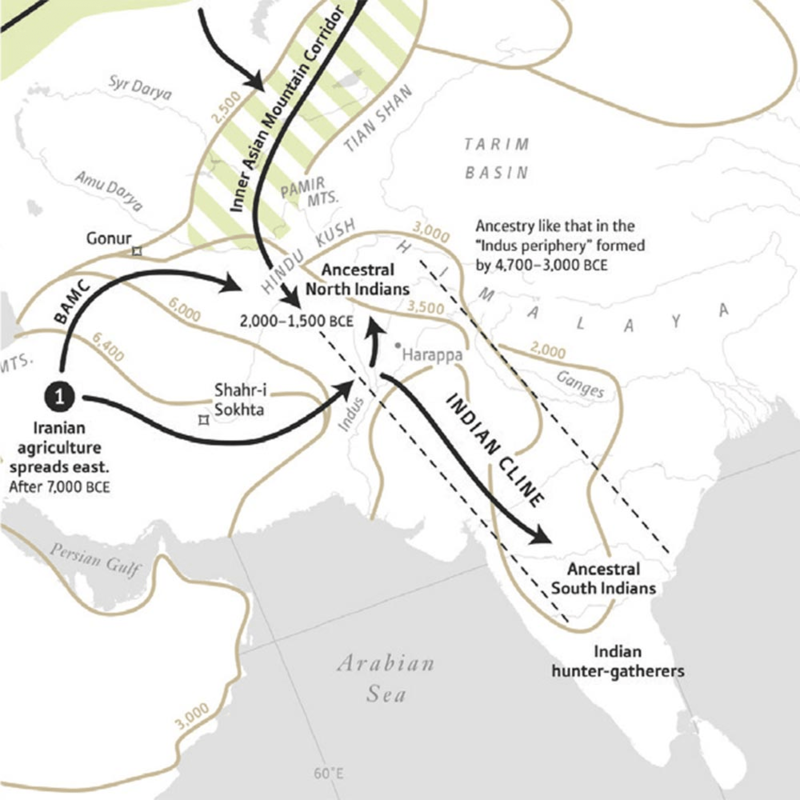 So, when we discuss the IVC, it is obviously a large area from Shortugai in Tajikistan in North, Sutkagan Dor near Gwadar port of Iran to Mundigak in Afganistan to Bhagpat in UP all are Indus Valley Civilization excavated Archaeological sites so far. This vast area could be possibly larger than the one known at present, because whatever IVC sites so far excavated are not and cannot be conclusively comprehensive ones, as more such sites still could be lying deep underground and unexplored in places much deep inside Tajikistan, Iran, Iraq etc. The Queen Kaikeyi in Ramayana, mother of Bharata is believed to be from present-day Iran. 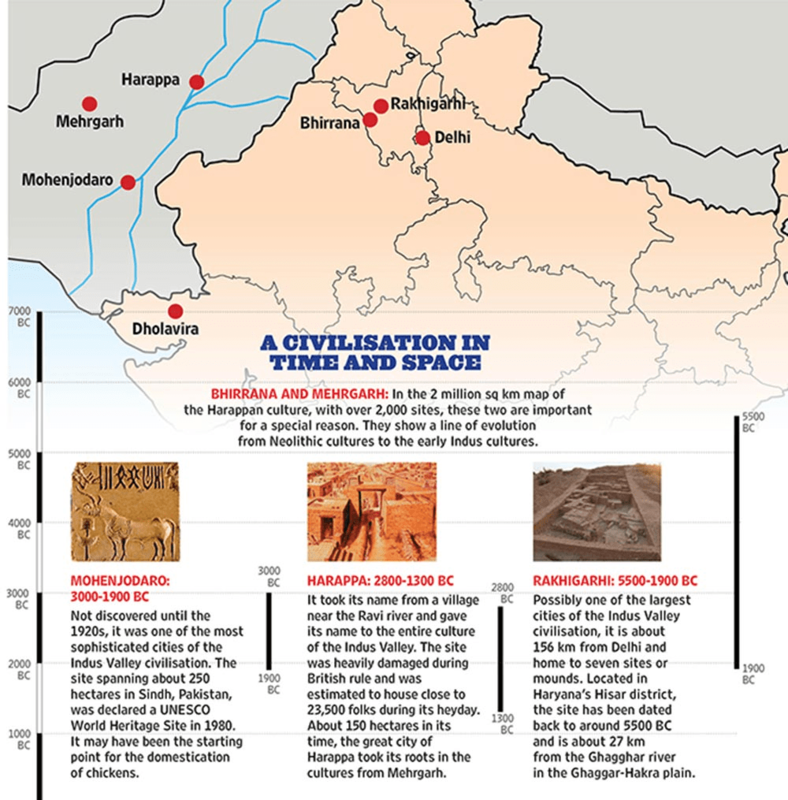 So the present day India in 5000-9000 yrs BCE was much larger and well connected under one Kingdom, one doctrine and one wisdom which is known as Sanatana Dharma, which was already in place and practice then. This finding is sensational. This view vindicates the nationalist’s view. But the catch is, overall it sumps up that the Harappan people were native to the land, and did not belong to the invading Aryans from Central Asia or that sort of a story. Secondly, this research confirms another fact that the Harappans later migrated to down south India and now be known as ‘ancestral south Indian tribal community. After having confirmed these facts in clear tone, a further confusing note has been added. It is confirming the fact that at the time of falling of IVC, the Aryan invasion took place from central Asia region, and that mixup occurred in later years. And this mixed population is cited in North India. ‘Prof. Shinde, cognisant of the patterns of evolution of agriculture in pre-Indus sites, (Shinde) agrees with the fallacy of crediting this great civilisation directly to the flow of genes and knowledge from what can be thought of as ‘non-Indian types’ in West Asia. Nations of the Near East and Europe (or China) all have aggressive claims on antiquity, which complicates historical research—being aware of that should ideally free Indian minds from that trap”. A careful reading of these observations suggests the following. Previous articleWhy the only significant Black member of Trump’s inner circle was fired….? Beyond the borders of present time Kazakhstan? Hahaaha. Only this much is enough to prove the utter foolishness of this article writer. No more reading is required. LEAVE ALONE FOREIGNERS, THE IDIOTIC HISTORIANS OF INDIA ALSO FELL FOR THE ARYAN INVASION THEORY AND MISGUIDED THE PEOPLE OF THIS COUNTRY FOR THOUSANDS OF YEARS. THESE IDIOTS WENT ON TO SAY THAT THERE WERE NO HUMANS AT ALL IN BHARATH BEFORE ARYANS CAME OR INVADED ETC., JUST LIKE IN EVERY COUNTRY, THERE WAS HUMAN I HABITATION IN INDIA. THE GERMANS IN THE TWENTIETH CENTURY Proved that there was no Such invasion. In fact Aryan is a Sanskrit word meaning intellectual or learned and BHARATH WAS FULL OF LEARNED PEOPLE THOUSANDS OF YEARS WELL BEFORE ANY OTHER COUNTRY. Please consider a simpler writing style. This article is full of information. I couldn’t, however, get past a few paragraphs the first time because of a lack of flow and clarity. Could the Agricultural practice have flown out of IVC to Iran ? IVF site at Rakhigadi pre dates Modern Iran. Hindu value system – the victim of the two judgements.